Reputation is give and take. Certain breweries are revered by name alone. Think Alchemist. Think Russian River. Toppling Goliath. These cornerstones of the craft brewing world have a prestige that makes them an instant buy, regardless of style, serving, or even price. You find something by Russian River in your local beer store, you buy it. On the other side of the spectrum, there are breweries that, for one reason or another, have failed to gain the favor of the drinking public. Some of them are so ubiquitous, it’s easy to take them for granted. Others simply haven’t earned the cult following of an Alchemist or Side Project Brewing. But we think they’re worthy of your attention. These are the American breweries that deserve a critical re-evaluation. The self-proclaimed Brewery of Mardi Gras, Abita has long since outgrown the bayou. Abita is currently the 21st largest craft brewer in the United States, offering their beers in 46 states. They’ve expanded into sugar-cane-sweetened sodas, and they even have tap handles at Disney World now. All the exposure has given the illusion that the 30-year-old Louisiana brewhouse has conceded quality for territory, but the opposite is in fact true. With eight flagships, there are bound to be some misses, but Abita’s twosome of Jackamo IPA and Turbodog brown ale are evidence enough that there’s more to be discovered in Abita’s sprawling product line. Purists may lament the pandering raspberry flavor of Purple Haze, but what other brewery do you know that’s built a 130,000-barrel empire off a fruit beer? Give Abita some credit. While Funky Buddha and Cigar City have become destination breweries in the rising craft beer haven of South Florida, Saint Somewhere has somehow managed to get lost in the boom. But far from farm country in the sweltering Gulf of Mexico, Saint Somewhere dutifully makes crisp and authentic farmhouse ales, distributing to 43 states though few could point to the Tarpon Springs brewhouse on a map. Their collection of high-ABV Belgian-style brews have romanced the locals, especially Cynthiana, which is made with local grapes, giving it a refreshing sauvignon blanc or chardonnay ester. But it’s more than just the beer that makes Saint Somewhere worth another look. Fans of the brewing company are invited to help bottle the beer in exchange for free libations. If only people were lining up to buy the beer like they are to package it. Sometimes, a hugely popular flagship can encourage drinkers to delve deeper into a brewery’s stock. Think Stone Pale Ale or Dogfish Head 60 Minute IPA. Other times, that beer can be where the public starts and stops — as seems to be the case with Magic Hat and their expertly balanced #9. The Vermont brewer has staked much of its success on #9, its name-making “not quite pale ale,” but nothing else in their portfolio has managed to catch on. Anyone who’s visited their circus-themed artifactory in South Burlington can tell you that there’s much more to be enjoyed from Magic Hat. Take, for example, Circus Boy, their lemongrass-infused hefeweizen, or the roundly malted Belgo Sutra Belgian Dark Ale. Both are examples of why the quirky “elixir” makers aren’t to be taken at surface level. Similar to Magic Hat, Colorado’s Oskar Blues has been a bit stunted by the success of their flagship. With two gigantic facilities in the United States pumping Oskar Blues to every bar, liquor store, and bodega in the market, Dale’s Pale Ale has basically become the Millennial answer to PBR. While it’d be tempting to say DPA is all the bottle-eschewing brewery has to offer, you’d be wrong. As we discussed last month, Oskar Blues didn’t stop innovating when they became one of the first breweries to can craft beer in 2002. Their Hotbox coffee porter and Death by Coconut porter show that the team at Oskar Blues is playing with a full toolbox of skills. They’ve even reinvented Dale’s as a gutsy tallboy double IPA, but it probably only hurt their bid for mass appeal. As the best beer town in the United States, Portland is a tough scene to tread water in. There are always new breweries and brewpubs popping up to serve the locals, and the old guard can easily get lost in the shuffle. Such has been the story with Lithia Creek standby Rogue Ales. Oregonians — and Americans alike — have stopped believing in Rogue’s ever-revising revolution. But that “revolution” is what keeps Rogue relevant as one of the most exciting, least predictable breweries in the country. They were one of the first to experiment with sriracha in the brew kettle, and since then, they’ve kept up the weirdness. They’ve made a braggot with marionberries they farmed themselves. They’ve made a maple-bacon-flavored ale with help from Voodoo Doughnuts. The spirit of boldness and experimentation is still alive and well at Rogue, so don’t sleep on this Pacific Northwestern stalwart. It’s easy to miss what a great beer Hell or High Watermelon is. The fruit-ified wheat beer from the Bay Area’s 21st Amendment is equal parts refreshing and complex, but it’s so unfortunately unheralded that it gets skipped for other summer seasonals with better reps. In fact, only five of their offerings have cracked a 4.00 rating on BeerAdvocate despite their Great American Beer Fest golds. Perhaps it’s the company’s goofy, uber-patriotic branding or the fact that they don’t deal in bottles or bombers, but 21st Amendment has a hard time being taken seriously in the craft beer world. With a solid line of IPAs and an expanding roster of rarities like their Marooned on Hog Island oyster stout, 21st Amendment are steadily making themselves harder to overlook. Minnesotans don’t want to admit that Third Street Brewhouse makes some of the best beers in their state. Birthed from the diversification of the much-maligned Cold Spring Brewing, Third Street started off on the wrong foot and seemingly hasn’t recovered, despite their best efforts. Considering the fact that they introduced their Minnesota Gold Lager to compete with locally endeared adjunct tallboys like Grain Belt Premium and Hamm’s, it doesn’t look like Third Street will be getting a fair shake with the locals, which is a shame. 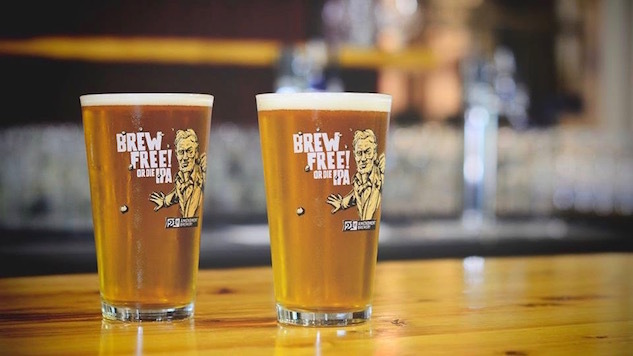 With early offerings like Three Way Pale Ale and Sugar Shack Maple Stout proving that the reincarnated brewhouse can make beer far better than their predecessor, Third Street are gradually returning the good name to their Northern Minnesota town. It’s only a matter of time before the rest of the business catches on. In a yearlong thread on the BeerAdvocate community boards, hop heads argued over the most underrated beermaker in the United States, and far and away the most namedropped brewery was Weyerbacher. That doesn’t necessarily mean that the 30,000-barrel Pennsylvania sudsmaker is indeed the most underestimated in America, but it certainly calls into question whether this huge-ABV brewery isn’t quite getting its due. Weyerbacher is truly unique in its holistic approach. The founders grow their own hops, which they use to flavor harvest and pale ales. They provide recipes for cooking with their beer. They instruct drinkers on proper cellaring techniques. Even if you think their high-alcohol, boldly flavored brews are just candy for beer geeks, at least they’re not dealing in any half measures. Hugh Sisson lost some momentum when he rebranded his company from Clipper City to Heavy Seas in 2010. Gold Ale, Powder Monkey Pale Ale, and Heavy Seas Cutlass Amber Lager have all improved since migrating from the Clipper City name, but they lack the nostalgia of the original moniker. The Maryland beer pioneer — Sisson opened the state’s first brewpub in 1989 — has since watched The Brewer’s Art and Full Tilt explode in popularity while their own growth has flown under the radar. The pirate-centric brewhouse is certifiably one of the best in the Old Line State. With Small Craft Warning Uber Pils being continually lauded in festivals, and Loose Cannon moving up and down the East Coast in cans, Heavy Seas’ stake outside Maryland presents a massive growth opportunity, but for now, they’re among the most slept-on breweries in the country. Much in the tradition of Lone Star, Rainier, and Old Style, Narragansett Lager is a regionally beloved bargain beer, but that doesn’t mean parent company Narragansett Brewing doesn’t have its eyes on higher concepts. When the brand was revived in 2005 after 24 years off the market, the new owners set up the craft branch of their business in their hometown of Providence. Gansett goes hyper-local for their craft brews, too. They’ve partnered with Rhode Island favorites Allie’s Donuts, Autocrat Coffee, and Del’s Frozen Lemonade on collaborative beers and brewed others in honor of H.P. Lovecraft and the USS Massachusetts, cementing their place in the hearts of Providence drinkers, but the rest of the world hasn’t discovered the 16-oz. craft spree taking place in the country’s smallest state.